It seems that I’ve spent the last few years waiting for God. It’s been hard. Patience doesn’t come easily for me. I just want to do something, ANYTHING, to get from where I am, to where I want to be. But God said, wait. So I waited. And waited. And waited some more. Until I thought God would never give me the green light to move forward with all that He has for me to do. And finally, I got it…the green light I’ve been waiting so long for! God gave me this verse recently to say, “Now is the time, go for it!” This new thing that God wants to do in my life means taking action and putting myself out there, something that I’ve been longing to do, but now it seems so scary. Will it work? Will I succeed? Or will I fall flat on my face? Whatever happens, I know I have to trust God and follow His plan. But God doesn’t just want to do something new in my life. He wants to do something new in yours too! 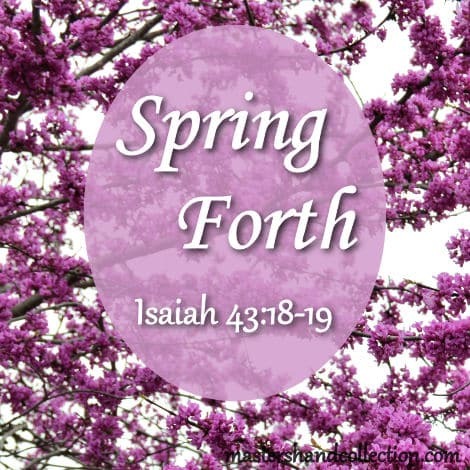 So let’s dive into this scripture and discover how we can spring forth! Let’s face it, we all have a past. And it probably has a few things in it that we’d rather not think about or share with the rest of the world. But that’s okay because God is giving us permission to let go of those hurts and disappointments from the past. So, whatever hardships you’ve endured up until now, take them to God and leave them at His feet. It’s okay to forget them and move on. Spring is finally here. And with it comes the beautiful blooming flowers and budding trees. All winter long these flowers and trees have been there resting, taking root and waiting for the right time to spring forth. We’re just like these flowers and trees. 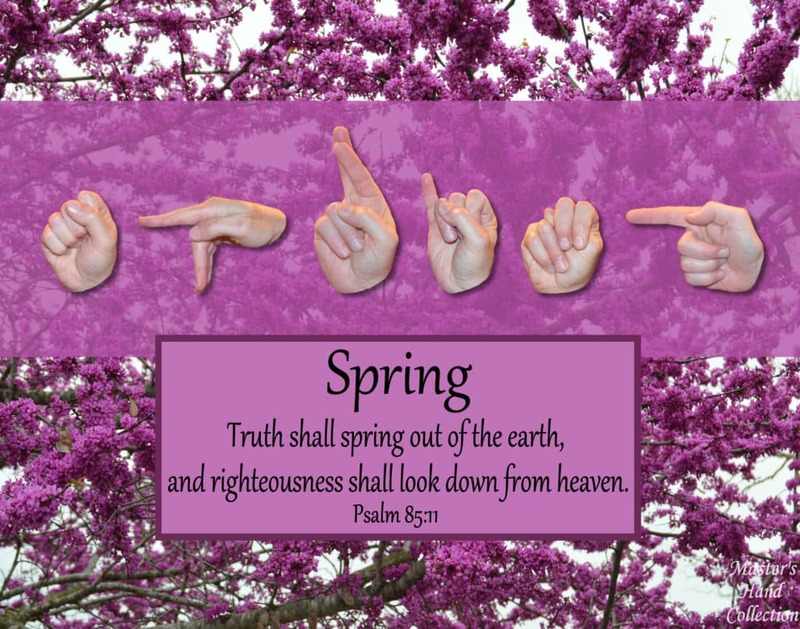 We’ve been waiting, praying and letting God’s Word take root in our hearts so that when springtime comes for us, we’ll be ready to bloom. Have you ever gone hiking? There are usually some pretty well-worn trails that other people, or maybe animals have made. Instead of stumbling through the tall grass, rocks and downed tree branches, we choose to walk these trails. When we start to take action and work toward this new thing in our life, we will face roadblocks. But God promises that He will go before us and blaze the trail. He will remove the roadblocks when they present themselves. 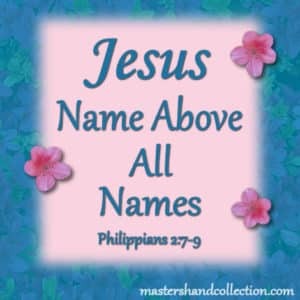 He will remove all of the debris in front of us and make a road for us to walk on. And He will lead us into this something new. There will always be roadblocks in our path, but we can hold tight to God’s promise, that He will make a road in the wilderness for us. Back to that hike through the wilderness, only this time it’s a hundred degrees in the shade. When the temperature is soaring, you’re going to get a little bit thirsty. All you can think about is a cold, tall glass of water. (And maybe some ice cream!) Okay, just the water, but we definitely need a little refreshment when it gets so hot outside. Likewise, when the heat is on in our lives and we feel like we’re failing in this new thing, it’s easy for our spirit to become parched. We’re so focused on the task at hand that we forget to replenish our resources, like reading the Bible, praying or seeking God’s will. But in the midst of our thirst, God is our oasis in the desert of our lives. He offers us a cool river to relax and refresh ourselves in because He understands that we get tired and discouraged when things are hard and don’t go the way we thought they would. So, when hard times hit us square in the face, all we need to do is to turn to God. He will fill us up when we’re empty and pick us up when we’re down. Then, when the thirst subsides and we feel better, we can continue on. Now is the time. God wants to do something new in your life! Will you let Him? Will you accept this new thing that He has planned for you? I know my answer. I will gladly accept this new thing. I will follow wherever He leads me. I will hold tight to His promises when things get tough. And, when the time is right, just like a blooming flower, I will spring forth. Yes, Connie, looking forward to new things and being out of the wilderness. Hi Rebecca! Spring is the perfect time for something new. I can’t wait to see what God will do next! Thank you so much for stopping by the blog. You are a blessing!